DLR scientist Paul Zabel will spend a year living and working in the Antarctic for DLR’s EDEN ISS project. His greenhouse is located 400 metres away from the Neumayer III Antarctic station. 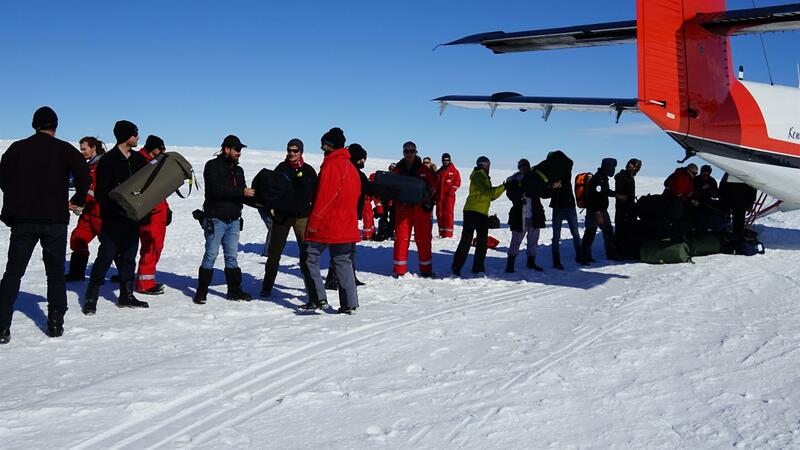 The international team of scientists and engineers bids farewell to the Neumayer III Antarctic station, leaving behind a total of 10 winter hermits. DLR scientist, Paul Zabel, will be in charge of the EDEN ISS greenhouse until the end of 2018. The long flight home from the Neumayer III Antarctic station: the DLR EDEN ISS project team depart. Winter hermit, Paul Zabel, will live in the Antarctic until the end of 2018 and remain in contact with his colleagues in the control centre at DLR Bremen via video link. 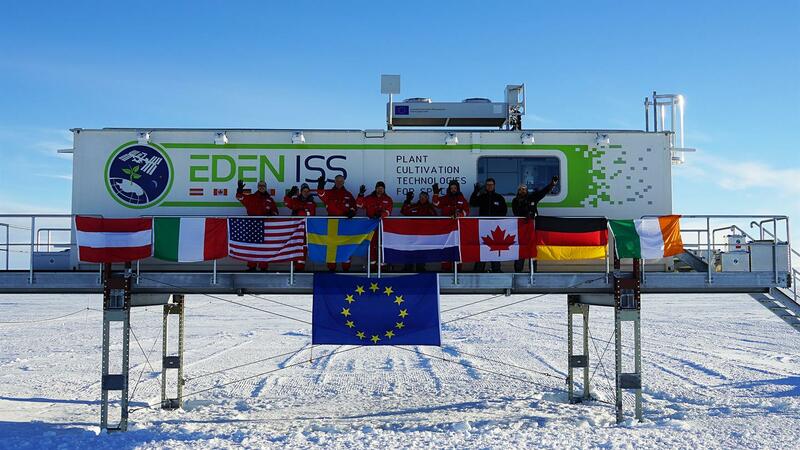 Planting begins in Antarctica: the EDEN ISS laboratory commences operation as a greenhouse. DLR scientist Paul Zabel to remain in Antarctica until the end of 2018, supported by the project team from the control room at DLR Bremen. The time has come: the EDEN ISS laboratory in the Antarctic has been set up, the first seedlings have been placed in the growth cabinets, and after eight weeks, the majority of the German Aerospace Center (Deutsches Zentrum für Luft- und Raumfahrt; DLR) team has returned to Germany. For DLR scientist Paul Zabel the only member of the EDEN ISS team to remain in the Antarctic until the end of 2018, this means that his winter deployment on the Neumayer III station operated by the Alfred Wegener Institute (AWI) has begun. Cucumbers, tomatoes and peppers will be the first home-grown crops at the world's southernmost tip. "Our aim is that there will always be something to harvest over the coming months," says DLR Project Manager, Daniel Schubert. After all, the harvest is intended to replenish the diet of the 10-person winter crew. In addition to tomatoes, cucumbers and strawberries, the scientists are also planting lettuce, rocket, radishes, peppers, basil, chives, parsley, lemon balm and mint. The plants are irradiated with artificial light. Instead of soil, which would not be present during a long-term mission in a spaceship, for example, a nutrient solution fortifies the cultivated vegetables and herbs. The water in this closed-loop system is recycled – and only leaves the container in the harvested food. "All the sub-systems such as lighting, irrigation, air circulation and cameras have been tested and work perfectly". However, the harsh environment around the greenhouse has resulted in a few problems: for instance, the researchers had to find a solution when condensation formed in their container. "It makes a difference whether the container is in a city or in the Antarctic," emphasises Schubert. Setting up the laboratory alone was laborious. If a tool was missing, for example, they had to return to the Neumayer station 400 metres away to fetch it. Not only did all this result in a stressful time for the DLR team – it also provided a wealth of experience required for a subsequent space mission. By the evening, explains Schubert, you were already exhausted. The DLR researchers had to get used to working in the laboratory, the extremely dry and icy Antarctic air, living in a confined space on the station with a total of 50 scientists and station crew and the four-bed rooms with shared bathrooms in the corridor. At this time of year, the Sun barely rises above the horizon before disappearing again an hour later at sunset. "You lose all sense of time and only know what day it is by what there is for lunch," says Schubert. "On Friday there is fish and Monday is pizza day." The scientists were also repeatedly visited by penguins curiously approaching the container and observing their work. Before Paul Zabel stayed behind as a ‘harvester’ in the greenhouse, he underwent training courses and received some final instructions: how do the various sub-systems work? Which plants need which care? He is now solely responsible for vegetable cultivation in the Antarctic: "I'm excited about this challenge," says Zabel. "It is similar to what astronauts will be doing on other planets in future: I will think about home a lot. But at least I have got something green to look at here in the greenhouse in the Antarctic. And of course I am rather sad that I will not be able to see my family and friends for many months." The rest of the team will remain in contact with him via a video link and telephone. While Paul Zabel is now tending the first plants to grow in the Antarctic, his DLR colleagues are watching from the mission control centre in Bremen, from where the participating researchers are actively involved and supporting the winter hermit. The working of the greenhouse (see above) is described in this animated film. You can follow news of EDEN ISS directly from the Antarctic on the Facebook and Instagram project accounts as well as on Twitter via #MadeInAntarctica.